Post Cards From the Past: The Harp - Why would Ireland pick such a wimpy national symbol? The Harp - Why would Ireland pick such a wimpy national symbol? Do you ever wonder why the Irish Harp is the symbol on the flag of Ireland or the symbol of Guiness Beer. I didn’t know either until my wife and I went to Branson, Missouri this spring. It is a great place and April is a great time to visit. Traffic is manageable, good seats are available at the shows, and the golf courses were open. We spent a sunny day in Silver Dollar City, which is sort of an amusement park with rides and live shows. One of the venues featured a renowned harpist, Dearbhail Finnegan, who played as et of traditional Irish songs and few show tunes on the Irish Harp. The first song she played, and my favorite, was called “Brian Boru.” Dearbhail explained that when she attended harp school it was a seven-year curriculum and she was required to learn “Brian Boru” proficiently to graduate. The piece symbolizes the last great battle fought by Brian Boru against the Danes in about 1015 AD. Brian Boru was one of the most exciting figures in world history. Born around 930 AD, he fought countless battles unifying Ireland and driving out the Danes. No small feat considering the rest of Europe and Britain were paying huge sums of Dane Gold to keep the Vikings from pillaging their cities and churches. Brian’s greatest battle was the battle of Clontarf where he literally ran the Danes off the Emerald Isle. Historians believe that this great warrior was in his 70’s when he actively led his forces into battle. After the battle, he was accosted in his tent by a group of stray Danes and he still managed to cut the legs off one of his attackers before they killed him. So why is song named after this famous High King, Ard Righ of Erin? He played the harp. Dearbhail Finnegan says that her school taught her he was a master harp player, so much so that the famous old harp preserved at Trinity College in Dublin is named the Brian Boru harp. Yes, named after him. 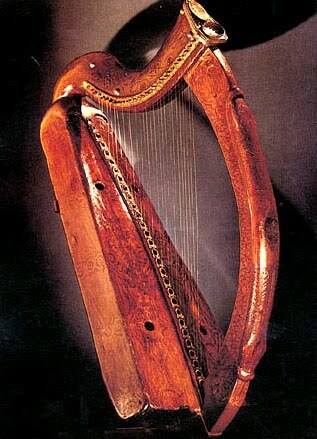 That harp was actually crafted much later in the 15th century, but it the oldest Irish Harp inexistence. I can only find fleeting references to Brian’s mastery of the instrument. Still, the legend is well accepted. You have to admit it is amazing that such a striking historical figure, noted as a supreme tactician, statesman, and warrior, would also be remembered as a master harpist. The song and harp are symbols at the very core of Ireland’s national identity. So if, like me, you thought the harp was chosen as Ireland’s national symbol because it was used by silly little Leprechauns, you were mistaken. Below is a youtube harpist playing Brian Boru’s haunting March. The harpist is not quite as good as Mrs. Dearbhail, but you will get the idea. Take a moment and listen to the heart of Erin.